Quite often at Consumerist, we hear stories that involve negative situations or feature consumers doing bad things. So when we read about people out there doing nice things for each other, we like to take note. To wit: a woman in Maine has started a campaign to help make sure all residents are dressed warmly against the cold this winter, by taping coats to light poles around town. Lest people think these jackets are missing their owners, attached to each one is a note from the Portland woman, reading: “I am not lost! 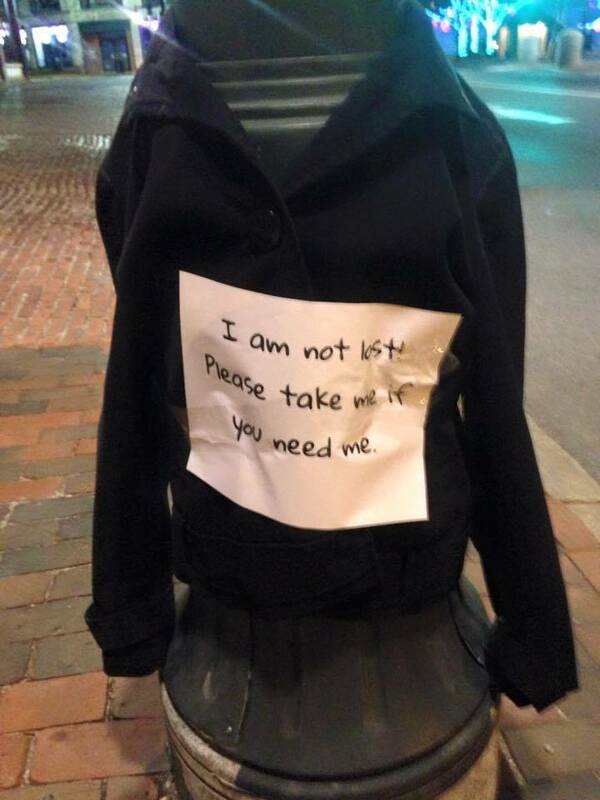 Please take me if you need me,” reports WCSH-6’s Grady Trimble, who spotted two of the jackets downtown. She told the news station that she’s been asking others to do the same, after buying two jackets for $1. 00 each at Goodwill and taping them up in the downtown area. As soon as she was back inside her car, she said she saw someone without a lot of layers on taking a jacket.